Mature women are often given the short end of the fashion stick. Rather than being allowed to grow into their age gracefully, society demands that they try to appear as youthful as possible for as long as they possibly can. But who says you can’t embrace your age and still remain stylish? Why are so many women over fifty discouraged from exploring shorter hairstyles? There are lots of short hairstyles for women 50 and older. Growing old gracefully doesn’t mean you’re stuck with a frumpy hairstyle. Consider the changes in your body as you look at shorter hairstyles you want to explore. While your basic face shape may not have changed, weight and muscle tone may encourage you to try a bob over a pixie or bangs rather than no bangs. Keep in mind too that your body shape is just as important in choosing a hairstyle at 50 as it was at 25. Short hairstyles for women 50 and older need to suit your face and your body in order to be most flattering. Don’t be afraid to be bold. If you think you’ll look good pulling off super short hair then go for it. Lots of celebrities have tried it and looked good doing it. 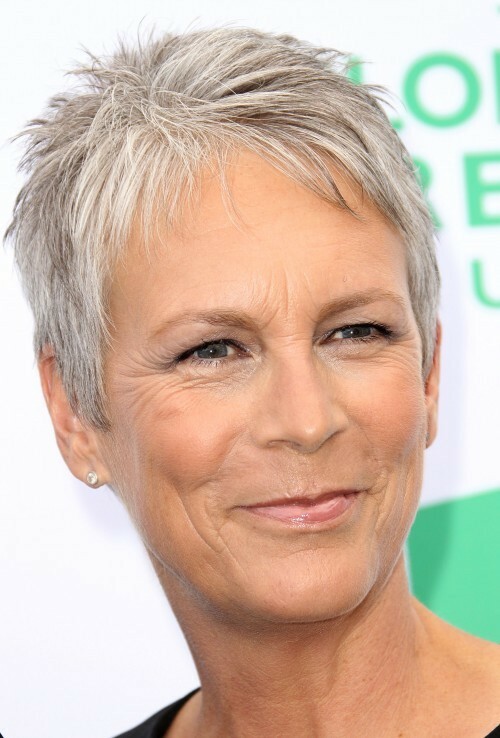 Take a page out of Jamie Lee Curtis’ book and fully embrace a shorter hairstyle. Be bold with color too! Don’t be afraid to go for full color or to embrace a natural grey. Talk with your stylist and don’t be afraid to go all the way.